Mt. Sawyer (W7W/KG-052) is a fun, easy 6 point summit that offers outstanding views of the Alpine Lakes Wilderness and way beyond. The trail head has good accessibility from good gravel roads. The summit rises to 5,501′ along the western end of the Tonga Ridge. 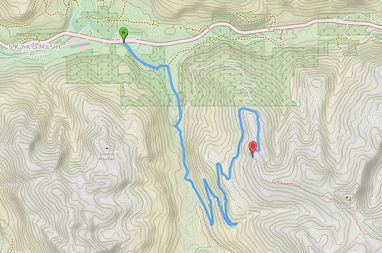 The hike to the summit has 1,200′ of elevation gain over about 3 miles (one way). The trails are well-maintained most of the way, although the final ascent includes some sections with vegetation encroaching into the trail. The summit itself has plenty of room for radios and masts, and some reasonably tall trees for wire antennas. We hiked in the late afternoon on a Thursday, and passed seven parties returning to their vehicles; we had the summit to ourselves. My hiking buddy Dave gave me short notice that he could get off work on Thursday afternoon, August 6th. The weekend prior, I had participated as a rover in the ARRL UHF contest, hence my SOTA equipment had been re-purposed and was now scattered around the shack. I hastily put together my pack, being careful to include everything needed to get on the air. I left at noon to meet Dave at his house. Half way there I realized I had neglected to bring my hiking boots, sunglasses, hat, lunch and coffee. Fortunately, all necessary radio equipment was in hand. The trip to Mt. Sawyer was about two hours from Lake Forest Park (north of Seattle). Essentially, we took U.S. 2 to Skykomish and turned right onto Foss River Road. That road turned into NF-68, which became NF-6830. In all, we drove about 12 miles on gravel roads to the trail head (click on map for larger image). You will need a Northwest Forest pass to park at the trail head. You also need a wilderness pass which, fortunately, you get at the trail head. Turn in one form an attach the other to your pack. As it happens, the trail was very sneaker friendly—smooth, wide, and with few rocks and roots. The only trick part of the trip comes after passing a dried up pond (on the left) just after seeing some views of the summit. The trail you are on follows the Tonga ridge, but the summit trail turns left and goes steeply uphill. One might easily miss this trail. 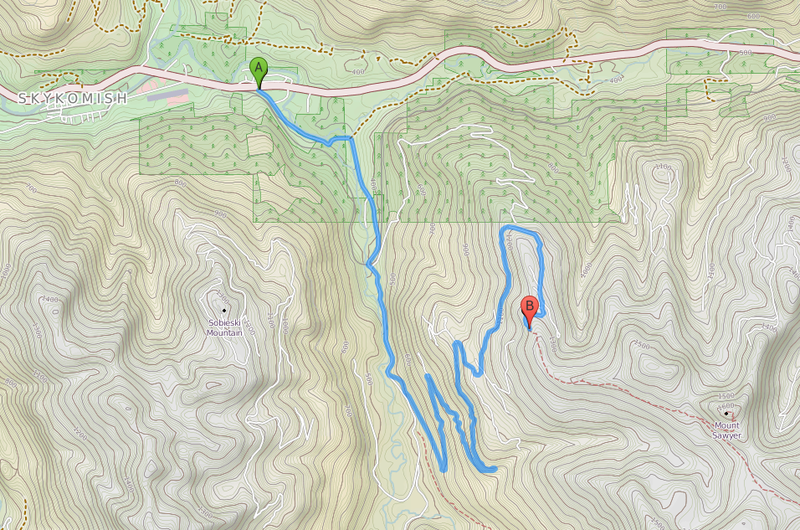 The rest of the trip is a series of switchbacks that climb steeply to the summit. The summit itself was splendid. I setup in a little rock nook next to the USGS marker (and near the U.S. Coast and Geodetics Survey marker. A small tree served to support a mast for a 4 element 2m yagi, and some nearby trees supported a long wire antenna for HF. I turned the radio on about 4 minutes ahead of my scheduled activation time and with only 34 minutes left in the UTC day. My buddy Michael, K5TRI, from Redmond, immediately came back to my call on 144.200 MHz. Mike, KD7TS, near Seatac was next with a solid signal. Soon, Brian, KE0CO, from Burien, worked me on 2m, and we QSYed to 1296.2 MHz FM to see if there was a microwave path. I was using 10w and a 2 element yagi, and we had no difficulties whatsoever getting through. Brian noted that he peaked my signal a little to the south of the direct path, so the signal found a fruitful path reflecting off of some mountain. After working four stations on 2m, I turned my attention to HF and worked six stations on 20m before the day ended. I stuck around to work some of them again on Wednesday morning (in Greenwich, anyway). After taking down antennas and packing up radios, we hung out at the summit for some time to enjoy the beautiful views. A quick hike back to the car, and we were one our way to a favorite pub in Mill Creek. Do you read my notes on your page wrote some weeks ago? ?